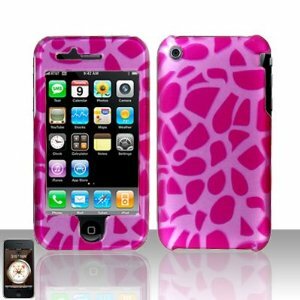 Protect and personalize your AT&T Apple Iphone 3G 3GS with this Latest Rubberized Image Fashion Design in Giraffe Snap on Hard Plastic Protector Cover Case. This accessory provides protection by preventing scratches and chips. Its perfect fit makes the phone look as slim as if it acted as an invisible shield. Hard plastic was reinforced to the front edges, sides and back of the phone to endure the life of this case. Besides, its phone shield protector has openings precisely made for the top and side buttons, charger port/Dock Connector, headset jack and speaker to allow full access to all the functions the phone offers. Fashionable animal print design. * Slim and Perfect fitting!